A few months back we jumped on the road to present our new range of Premium Hamburgers around every corner in Spain. 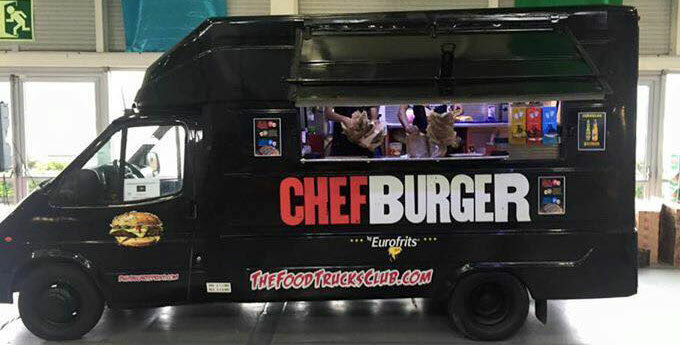 We put our ChefBurger “on wheels” in a spectacular food truck that has already covered some cities nationwide. We jumped on the wagon of this very American concept of selling food on the go, which has become quite a trend in our country. Would you like to know their story? The first restaurants on wheels were devised over 100 years ago in the United States, with the prime goal of making life easier for the dwellers of the young country. In Spain there is the churros trucks are a precedent. They have been a permanent feature in local fairs for at least 30 years. Street food selling is common for chestnuts for instance, but with small wheel carriages. Since 2014 food trucks have become increasingly popular. For now, in Spain we will only be seeing this gastronomic model in street markets and fairs, given that street vending is strictly legislated. Nonetheless, it has been the big attraction in every event since its arrival in 014. Some say its popularity might be linked to the slowed down cycle of the economy: a truck has admittedly a lot less costs attached than a restaurant in a building. Whatever the reasons may be, it´s plain to see that projects involving food trucks allow any chef to exploit and display all their talent so we can all get a taste of the most creative high-end cuisine. The buzz is loud enough to cause associations such as “Street Food Madrid” to spring in defence of a change in the law to allow talent and entrepreneurship to fill our cities with street food. What seems unquestionable is that this cuisine and its vintage allure are spinning gastronomy around. Or at least taking it for a ride.